Has a question ever changed your life? "A good question ... is like an alarm clock," wrote Elder Tad R. Callister. "It awakens us out of our mental doldrums [and] jump-starts our mental engines." A woman was in a church meeting, studying Philippians 4:8: "Whatsoever things are true, ... honest, ... pure, ...lovely, [or] of good report; if there be any virtue, and ... any praise, think on these things." She felt the Holy Spirit say to her, "Is there anything honest, pure, or lovely in your soap opera?" She had to confess that the program was not lovely or of good report or praiseworthy. Then the Spirit whispered another question: "So what are you going to do about it?" What this sister heard from the Spirit that day were life-changing questions, and her decision to give up her soap opera made a profound difference in her life. Where can we find questions that will awaken us out of those mental—and spiritual—doldrums? 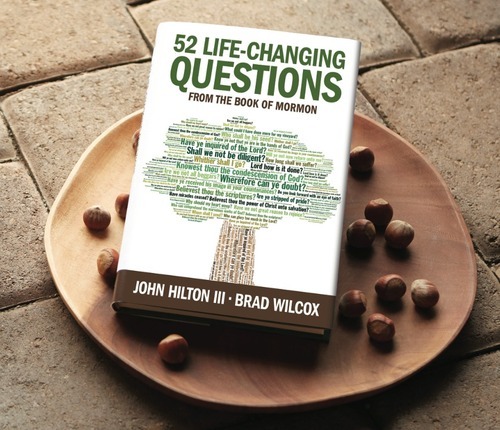 Popular authors John Hilton III and Brad Wilcox help us recognize and ponder fifty-two powerful questions from the Book of Mormon—one for each week of the year. One short chapter each week has the power to change your life. Have ye spiritually been born of God? Know ye not that ye are in the hands of God? Joseph Smith promised that we would get nearer to God through the Book of Mormon than through any other book. Pondering its inspired questions can propel us forward to attain that promise. CLICK HERE to see "52 Life Changing Questions from the Book of Mormon" featured in LDS Living's blog. Questions have a way of motivating us to think deeply and see things differently. They can lead us toward life changing growth. Questions are important. The authors have chosen 52 questions to focus on- which is kind of perfect if you want to focus on one question per week of the year. (Perfect New Year goal!) I think it would be a good thing to do as a couple- to read a chapter together each week and discuss it and think about it during the week. Of course you could do this individually as well. 52 Life-Changing Questions From The Book of Mormon is a tool that we can use to help us focus. 52 questions, one for every week of the year, to help us focus our thoughts and turn to Him. We spend a lot of time thinking about what the scriptures tell us, not nearly as much time thinking about what they ask us. How is it that ye have forgotten? Have ye inquired of the Lord? Are we not all beggars? How long shall we suffer? Why do not angels appear unto us? What evidence have ye that there is not God? Will ye not now return unto me… that I may heal you? Have miracles ceased? These are all questions that are asked in the Book of Mormon. Brad Wilcox and John Hilton III put those questions and more in historical and scriptural context, show us a few of the lessons that we might be able to learn from them, and how to find the answers we seek. By drawing on modern examples in our day, these men help make these questions relevant to us individually instead of them just being words on a paper. A book with a lot of thoughtful counsel and questions to consider. I'll just say right out that this book really makes you think about God and his commandments. This is the kind of book that you can read over and over again and learn something new every time. I love the fact that the book is based around questions. 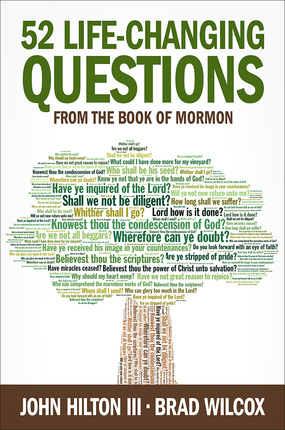 Out of the 543 questions asked throughout The Book of Mormon, the authors have chosen 52 to highlight in this book, starting in 1 Nephi and running through Moroni (these are different books within The Book of Mormon). 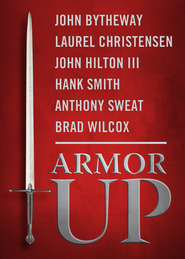 After sharing the context of each question, the authors share stories and thoughts about the importance of the doctrines and counsel contained in each question. Questions, if used well, are a powerful way to teach and to learn. This book shows that very clearly. The authors emphasize the need to not just read the scriptures but to respond to them and one of the best ways to do that is to think about how one might answer the questions posed by the scriptures. Truly a wonderful, thoughtful read. When I first picked this book up, I thought, "Wow! There are 52 questions found in the Book of Mormon?" And then I remembered Alma 5. There are quite a few in there (42), so I guessed it would be possible to have 52. Imagine my surprise to discover that there are actually 543!! I love the format of the book. There is a question given for each chapter and then stories, other scriptures, quotes, and the authors thoughts. Together, they all help jump start some serious thinking. I must admit that there are times when it's not always easy to "liken the scriptures" to myself and my life. I thought this book had some very great insights on how to do that. I loved how each short chapter gave a real life story to go along with the question. It made me realize that sometimes I make things harder than they need to be and the simplest of experiences can be applied to my life. These questions are definitely food for thought and I believe it would be easy to spend a week pondering each and every one of them. There were many, many questions that I hadn't ever given a second glance to and others that I had pondered on a little bit before. I found a question right off the bat, #2, "Shall we not be diligent in keeping the commandments of the Lord?" that really hit me and helped me a lot in my personal life. There were many amazing chapters that really hit home for me--too many to sit and list. I'd like to take more time to really go through, pick apart, and ponder each chapter. There is so much food for thought in this book. I love the idea of there being fifty-two questions--one for each week in a year. The only problem was that after I read the first chapter, I wanted to just keep going. I did, however, find it refreshing to limit the reading so I could really focus on the one question, and look for the answers and applications in my life over the next seven days. 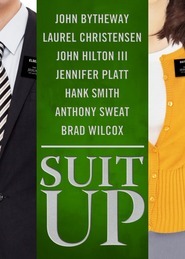 I love how the authors of this book helped me see modern applications of the questions from the Book of Mormon, making it easier to liken the scriptures to me and my situation: Mentions of Facebook and modern missionaries, stake conferences and higher education--all things I can relate to right now, in this stage of my life. The first line reads, "Has a question ever changed your life?" For me, the answer is yes. And lots of questions over the years have given me pause and some have shifted my perspective on certain issues. I learned that there are 543 questions in the Book of Mormon. They've taken 52 questions, one for each week of the year, and discuss it in context and then focus on how pondering and applying the question can impact our lives. I enjoyed reading through the questions. Some I have pondered on: "Have ye inquired of the Lord?," "Have ye received his image in your countenances?" and "How long shall we suffer?" Others I've never even considered: "Is not Calno as Carchemish?" is one and I'm glad it's included because I'm not sure where I would have started with that one. The chapters are short and they give good stories and examples of how we can apply the questions in our own lives. This is a great book for someone like me that hasn't thought to do this regularly on my own. As I was reading through it, I thought it would be a great self-development project for 2014. I have index cards so I figured I would write a different question on each one and jot my notes on the back of the index card during the week and see where I am at the end of the year. Then I read the Conclusion where they remind you that there's still 491 questions to go, which at one each week will take a little over nine more years to get through. And they didn't end there. There are 3,444 questions in the other standard works (another 66 years' worth) and the reminder that we receive new inspired questions in every general conference. So, my one year project has turned into a lifetime of pondering and asking questions from the scriptures. And you know what? I'm excited to get started--and I better buy a lot more index cards! There were many, many questions that I hadn't ever given a second glance to and others that I had pondered on a little bit before. I found a question right off the bat, #2, "Shall we not be diligent in keeping the commandments of the Lord?" that really hit me and helped me a lot in my personal life. There were many amazing chapters that really hit home for me--too many to sit and list. I'd like to take more time to really go through, pick apart, and ponder each chapter. As I started reading this book, I was surprised by just how many questions are asked in the Book of Mormon (543)! It seems to me that with this many questions, there must be something that we are meant to learn from them. 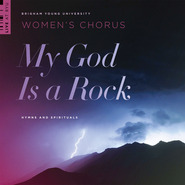 That's what is so amazing about this book, there are 52 chapters and each of those chapters is based on one of the questions from the Book of Mormon. These are questions that can help us discern more about our own personal life. They can help us learn more about our Heavenly Father. They can even help us know just how we need to change our own lives to be better able to become one with our Savior, Jesus Christ. I am going to make it my own personal goal to read one of these each week next year, study about it and really ponder it for the whole week and see just what I can learn. 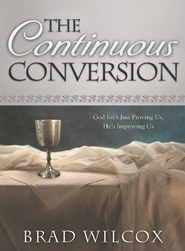 But this book has the ability to not only change lives, but to further our progression in becoming more Christ-like. These two amazing men have found all of the questions that are in the book of Mormon...there are 543 to be exact. *Shall we not be diligent in keeping the commandments of the Lord? *How is it that he cannot instruct me? *and Why should my heart weep? Stories and examples teach us how to apply each question to our own lives. but by when they stop questioning." but when they fail to do something about their doubts." The question I have been studying this week is: Why do ye smite your younger brother with a rod? Very interesting...didn't realize what I was really doing...must work on that! I really appreciate 52 Questions. Sometimes I have trouble likening the scriptures to me and what's going on in my modern life. I find myself thinking about what the people in the stories must have been going through and how they must have felt, but I picture it there, in the past, the way they experienced it. Not every time, of course. So it was nice to get someone else's insights and ideas of how the gospel can influence our lives, if we allow it. I like how the authors mention Facebook and modern missionaries, stake conferences and higher education--all things I can relate to right now, in this stage of my life. 52 Life-Changing Questions from the Book of Mormon will give you a year's worth of focused guidance--principles to ponder and insights to glean. 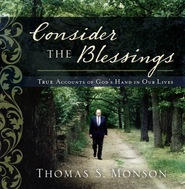 I've found it to be a wonderful companion book that I enjoying reading in conjunction with my daily scripture study. And maybe it'll inspire me enough to come up with a few life-changing questions of my own. What an amazing and helpful book this is. We are so blessed that in our church we have so many wonderful resources to help us get closer to our Heavenly Father. We can attain that through thorough scripture study. This book can help you do that. Starting at the beginning of the Book of Mormon, each chapter for each week, focuses on a different topic. Ie: keeping commandments, the twelve apostles, the rod of iron, etc. Each topic that can help you in your personal scripture study. I love that I have this book in my home to help teach my children and strengthen my own testimony about the Book of Mormon. I love the idea of how a question can change your life, prompt you to do better, serve others, become more Christlike. And I love how Wilcox and Hilton have delved into the questions of The Book of Mormon and how those questions really can change our lives. I'm excited for how this book has rejuvenated our family scripture study and expanded The Book of Mormon to my young children. I have found many answers to my prayers as I have read this book. I love the stories that are told and the doctrine that is discussed. I suggest this book to anyone especially those looking for ways to study the scriptures in a more deep yet simple way. I have been reading this book little by little before bed and have loved the spiritual insight and application that John Hilton III and Brad Wilcox offer. 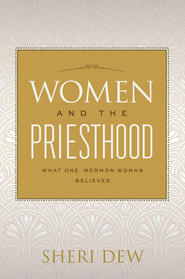 The chapters are short (about 4 pages each) and provide great discussion on questions from the Book of Mormon. Each chapter begins with the question from the Book of Mormon, then question is then developed using stories and analogies and words of the prophets so it can be better understood, and then the authors help the reader make application of the question. My favorite part is how at the end of the chapter the question is re-stated in large, bold font for the reader, almost like an invitation to put its principles into practice. Whether you read it all in one sitting, or a little every few nights, or just take a question per week for a year, this book is bound to inspire and bless you. I have been searching for a way to bring my scripture reading to life. Now I found it! Everyone says to keep a study journal, but I didn't know what to write in it until I found this book. Now I am responding to the questions in the Book of Mormon and I am finding so much to think about and write about. The short easy-to-read chapters in this book are just enough to get my brain going. The stories and personal experiences shared by the authors are so good. The quotes they share are excellent as well. I have seldom thought so deeply about the scriptures. One question a week. I can do this!